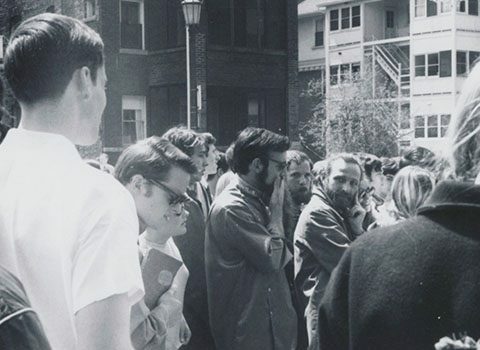 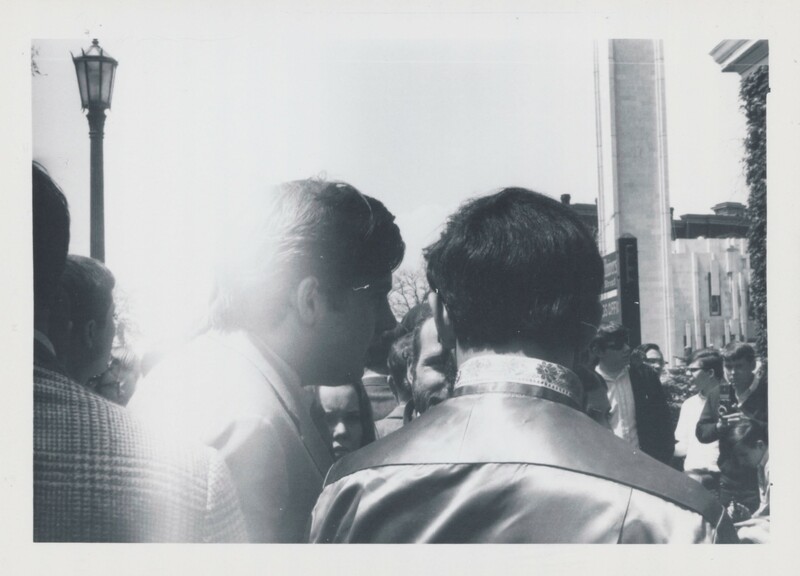 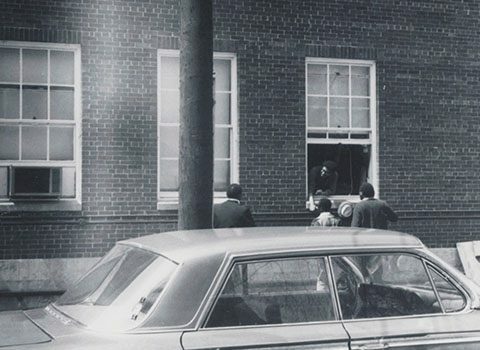 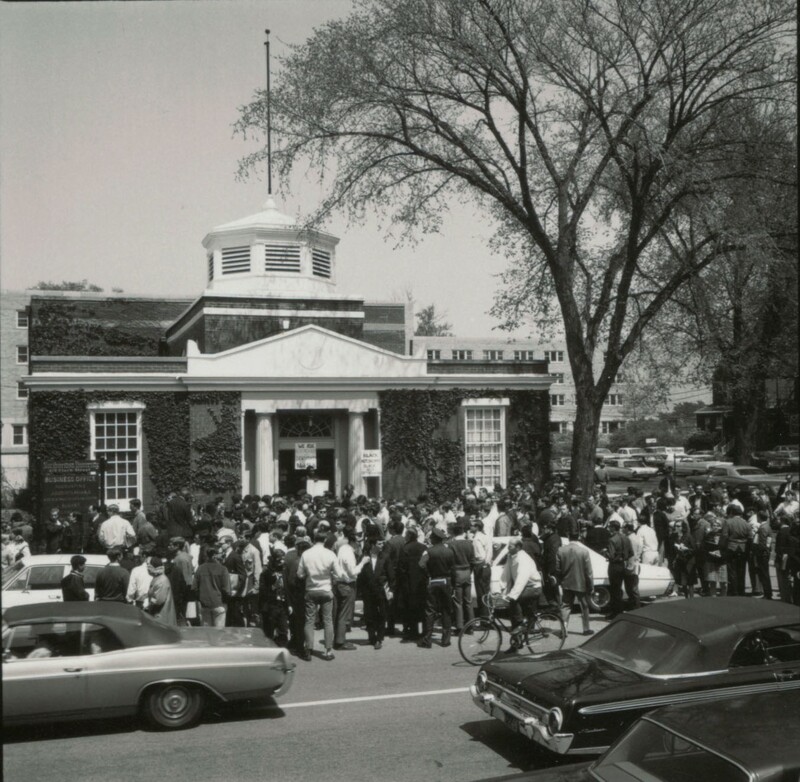 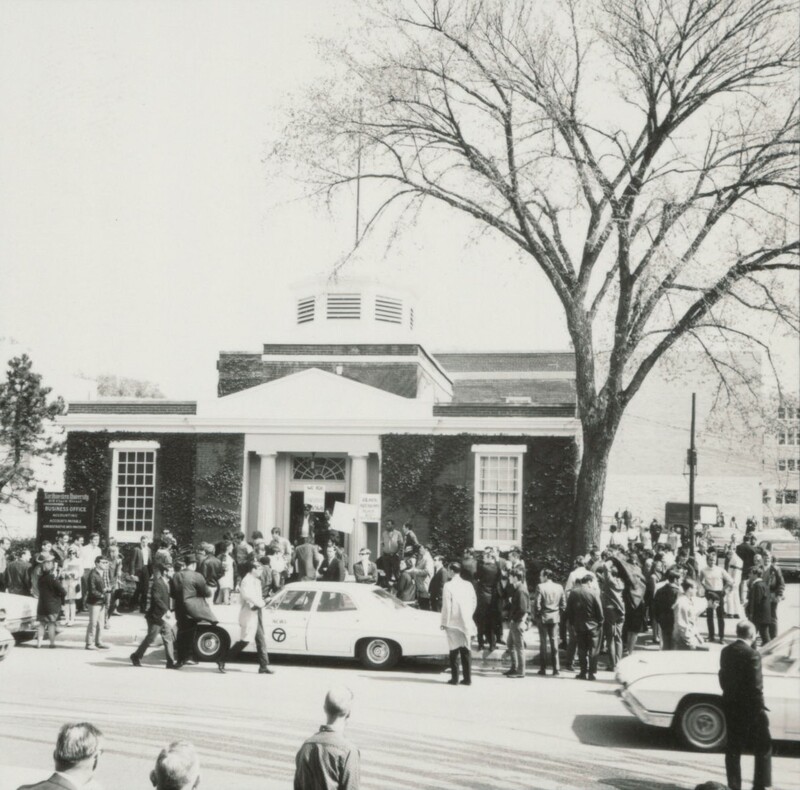 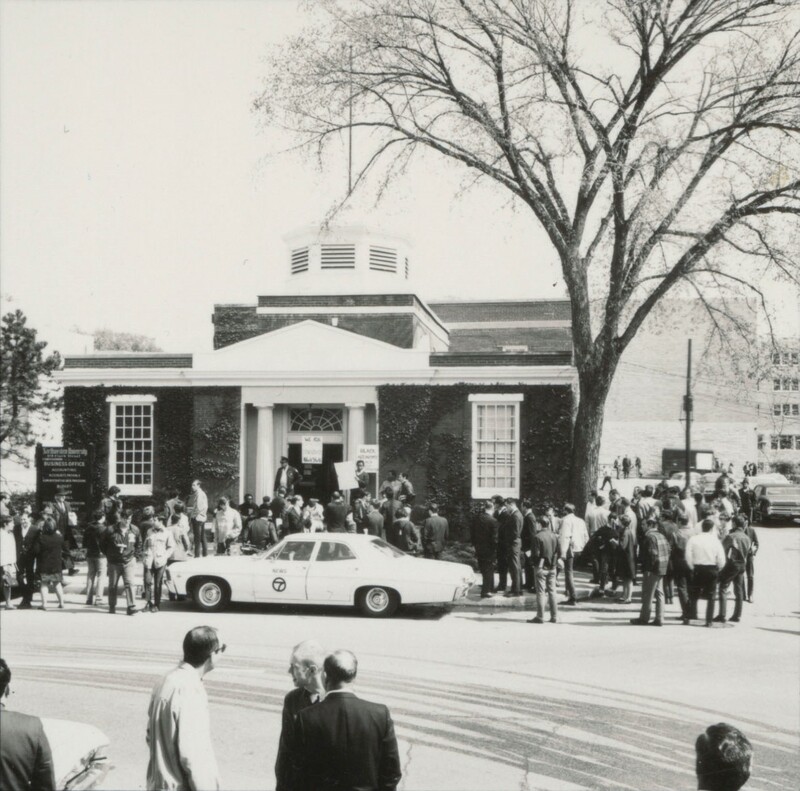 The following photographs portray the May 3, 1968 Takeover events outside of the Bursar’s Office on 619 Clark Street. 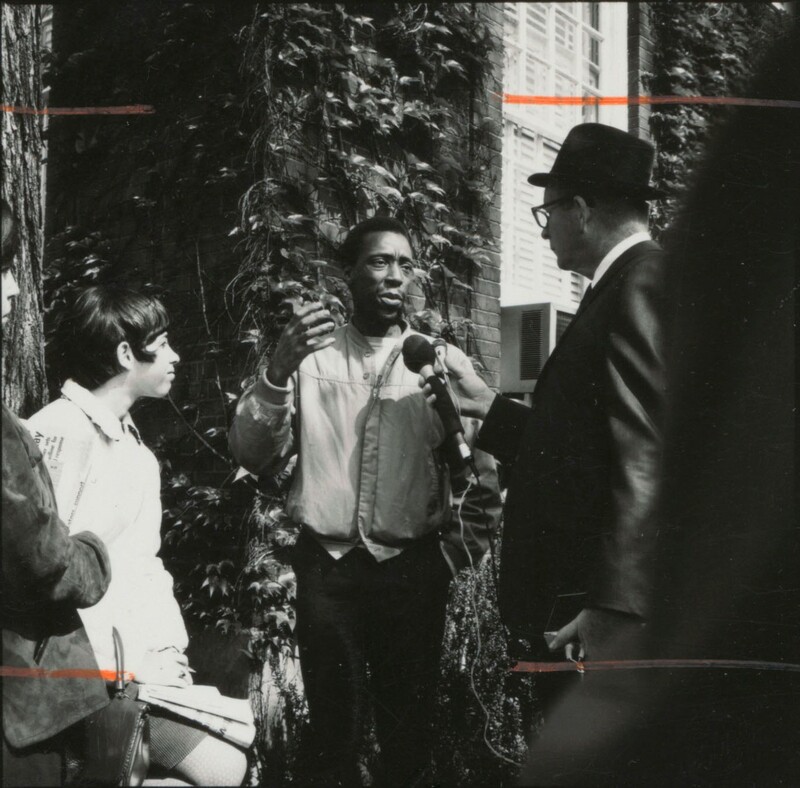 To view a description of each photograph, roll the mouse over the images. 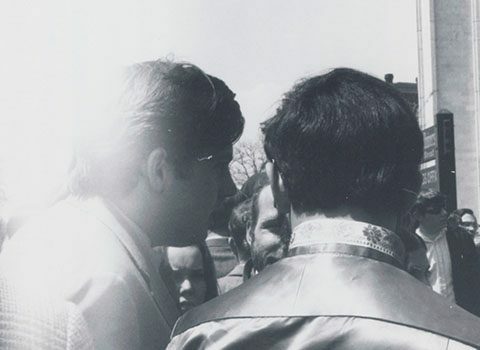 Click on the images for a full view, and click twice for an enlarged view. 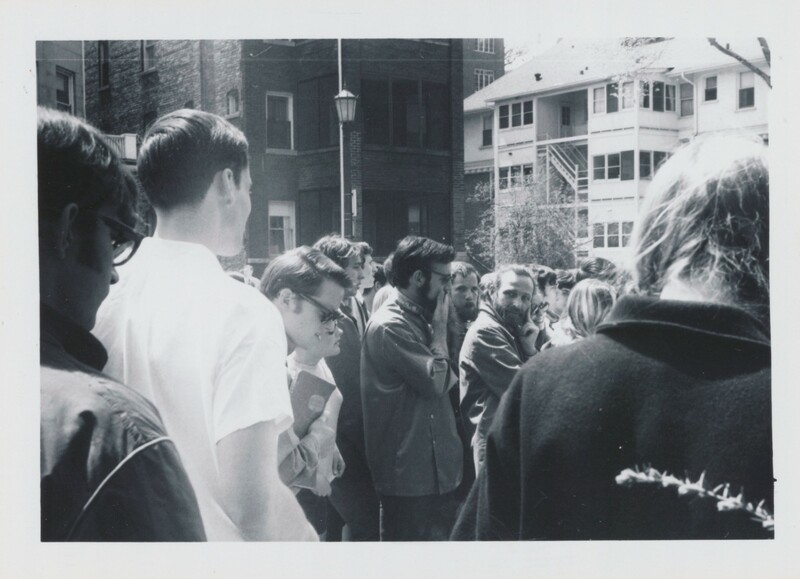 Visit Northwestern Libraries Image Repository for downloadable images. 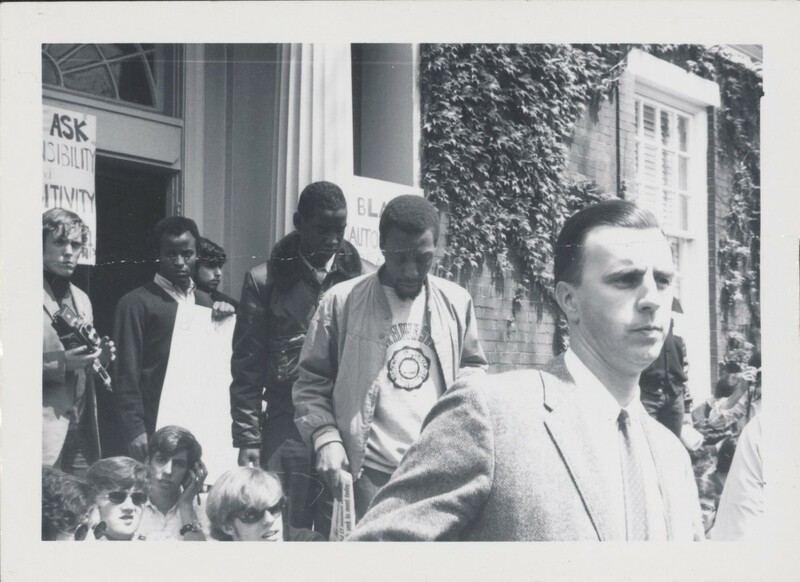 If you have additional photographs from the Takeover or of Black student life at Northwestern University that you are willing to share with University Archives, please contact archives@northwestern.edu. 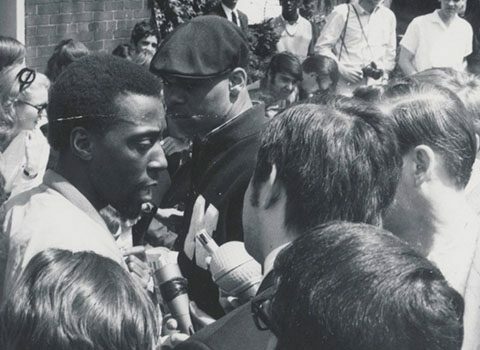 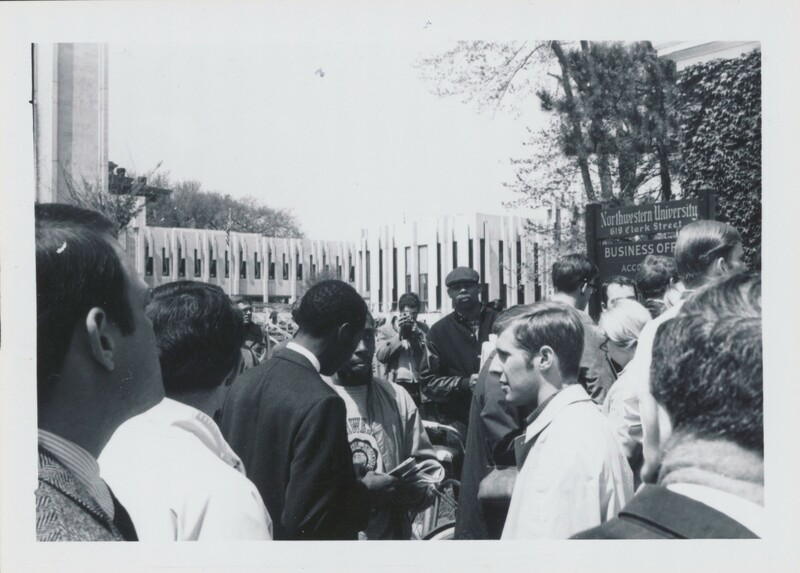 Throughout the day on Friday, May 3, 1968, James Turner, President of Afro-American Student Union (AASU), and a lead negotiator in the Bursar’s Office Takeover, and Jack Hinz, Northwestern University Dean of Students and Vice President, met to negotiate an agreement between FMO, AASU, and the University regarding the April 22 demands presented to the NU by FMO and AASU. 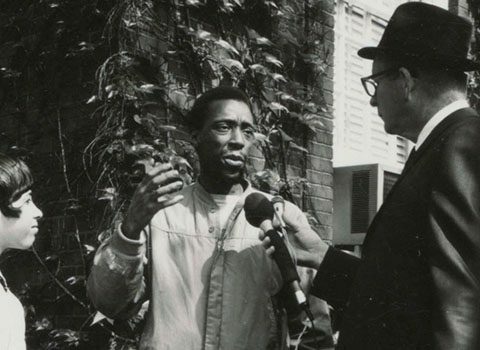 James Turner, President of Afro-American Student Union (AASU), and a lead negotiator in the Bursar’s Office Takeover speaking with the press. 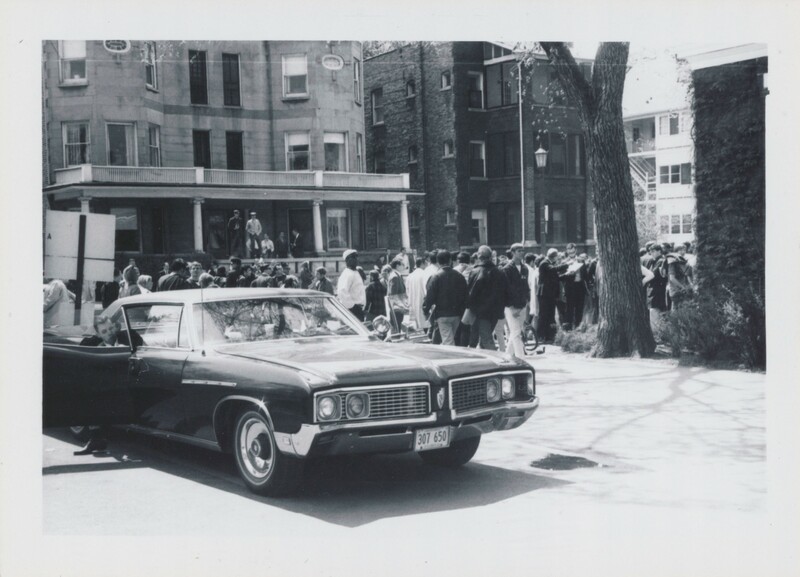 This photo is taken in front of the Bursar’s Office on 619 Clark Street in Evanston, IL. 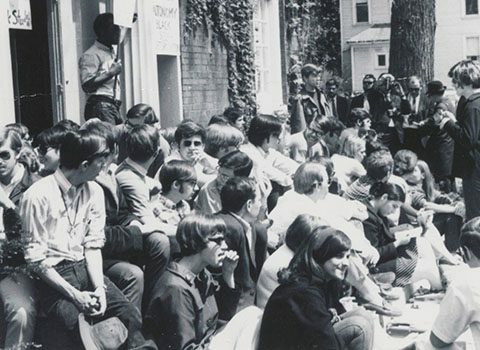 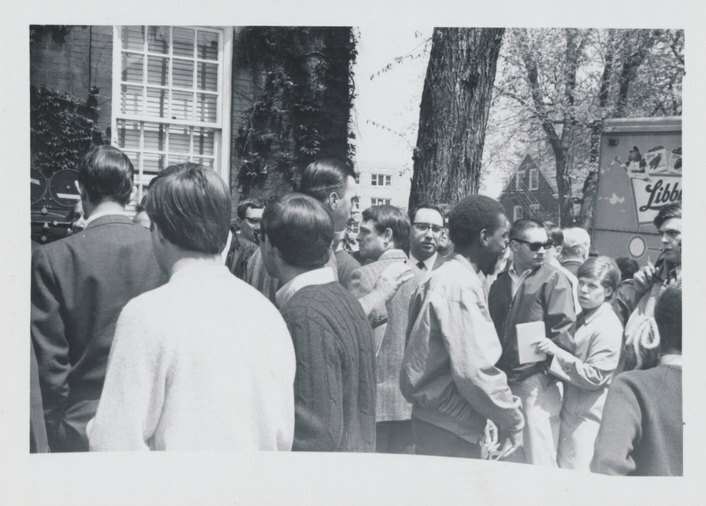 A crowd consisting of students, Northwestern staff, and the press gathers in front of the Bursar’s Office on 619 Clark Street in Evanston, IL as over 100 Black Northwestern University students occupy the building as a means to compel the administration to address discriminatory campus policies and to heighten awareness of Black students’ experiences of alienation at Northwestern University. 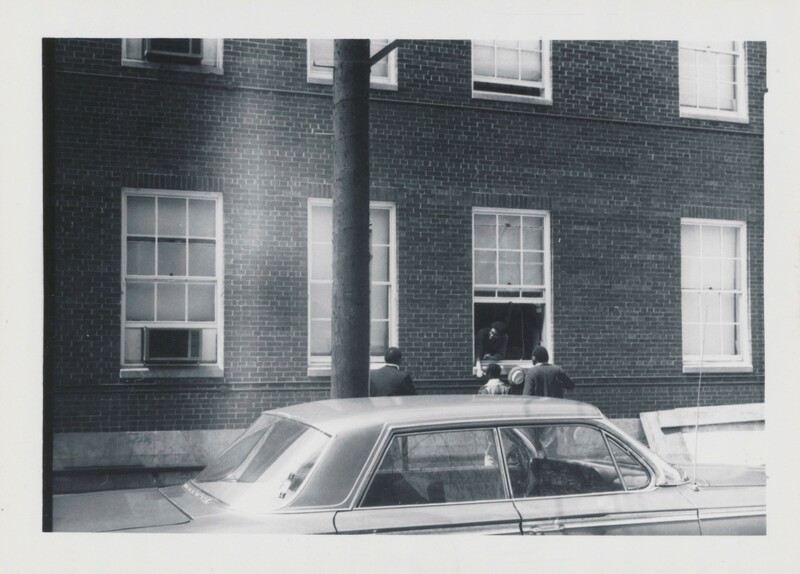 This photo is taken on the side of the Bursar’s Office on 619 Clark Street in Evanston, IL. 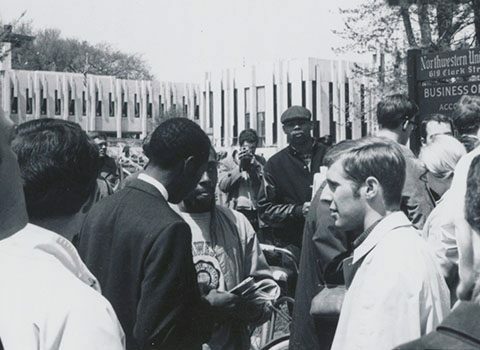 Throughout the day on Friday, May 3, 1968, James Turner, President of Afro-American Student Union (AASU), and a lead negotiator in the Bursar’s Office Takeover, and Jack Hinz, Northwestern University Dean of Students and Vice President, met to negotiate an agreement between FMO, AASU, and the University regarding the April 22 demands presented to the NU by FMO and AASU. 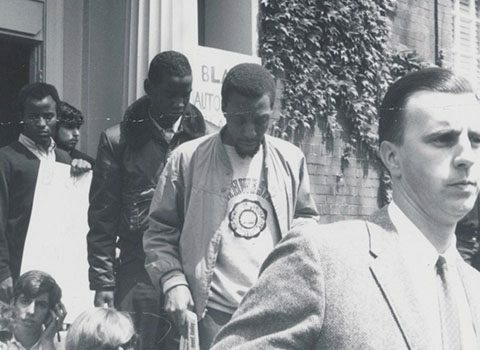 Officer Venice Deeze, a friend to Black students, stands behind Turner. 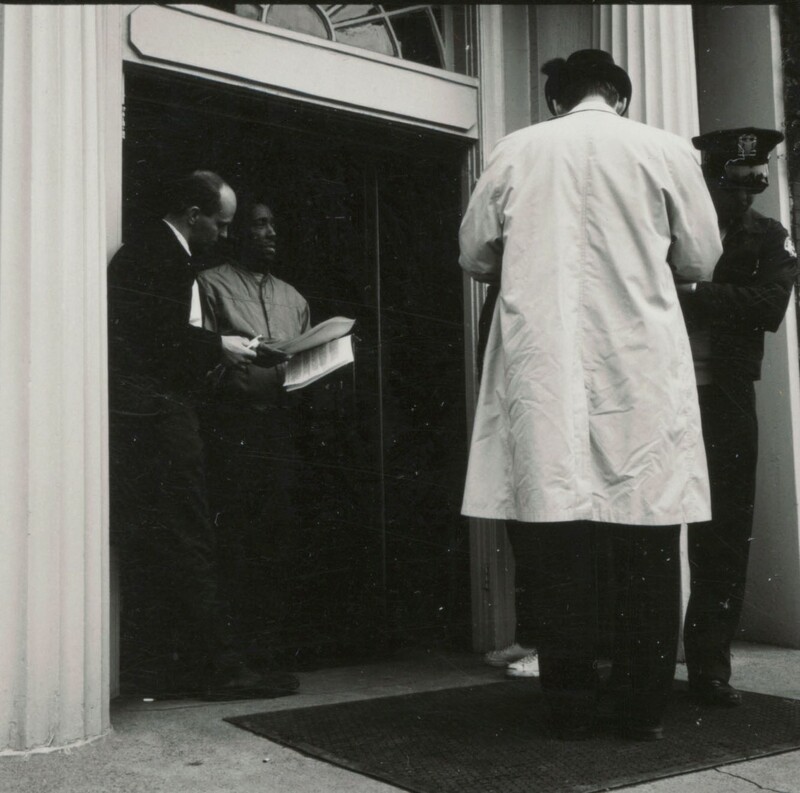 New Description: James Turner, President of Afro-American Student Union (AASU), and a lead negotiator in the Bursar’s Office Takeover speaking with the press in front of the Bursar’s Office on 619 Clark Street in Evanston, IL. 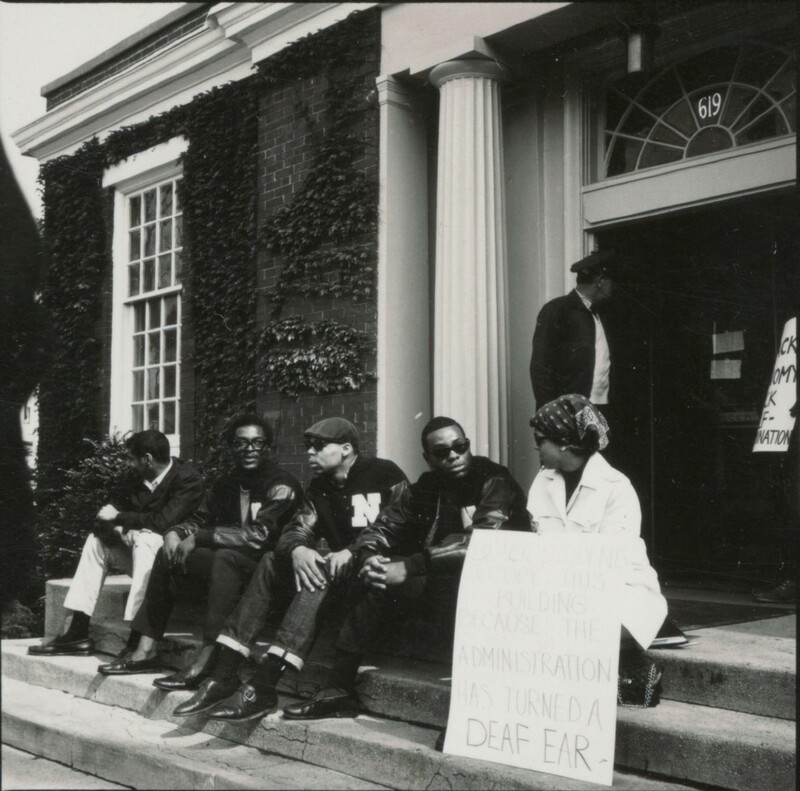 The image includes from left to right Harold Daniels, Officer Venice Deeze, a friend to black students at Northwestern, James Turner, and Mike Hudson. 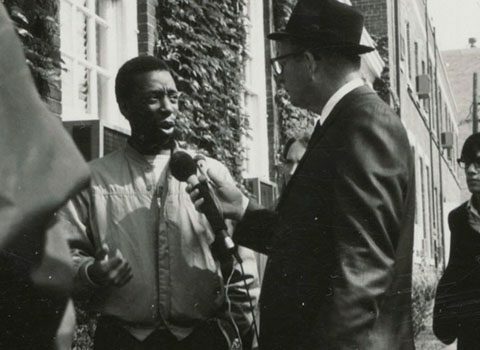 James Turner, President of Afro-American Student Union (AASU), and a lead negotiator in the Bursar’s Office Takeover speaking with the press in front of the Bursar’s Office on 619 Clark Street in Evanston, IL. 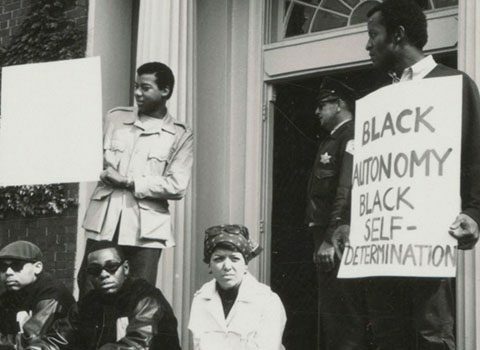 Northwestern University students, largely white students pictured here, join in solidarity with over 100 Black Northwestern University students occupying the Bursar’s Office as a means to compel the campus administration to address discriminatory campus policies and to heighten awareness of Black students’ experiences of alienation at Northwestern University. 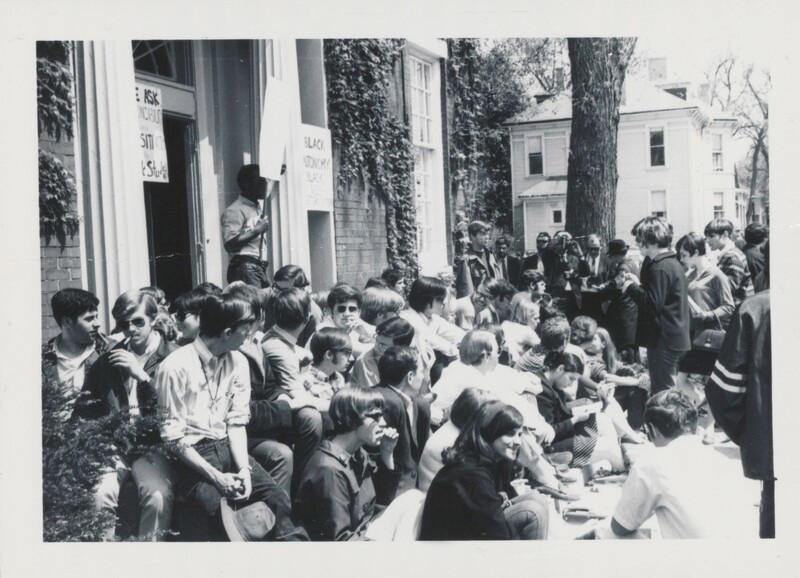 By sitting on the steps of the building, students were physically blocking the entry way to prevent an incident of police forcibly removing students inside. 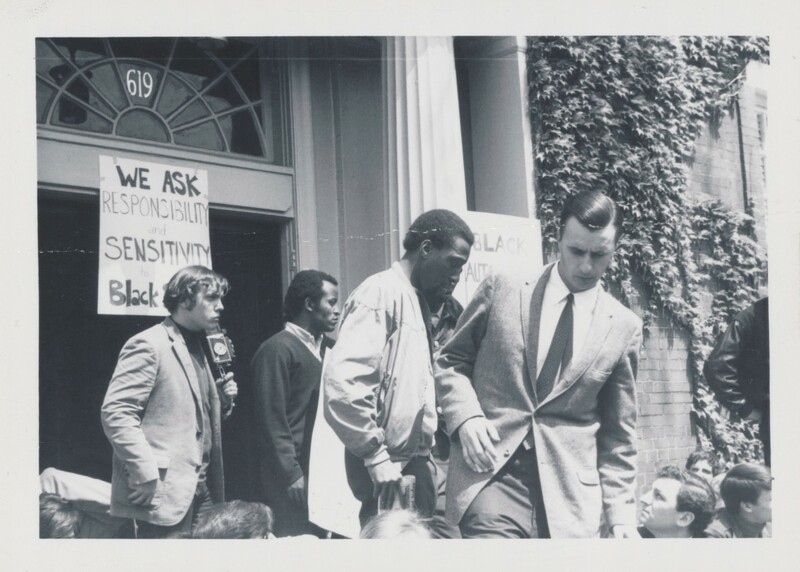 Members of Students for a Democratic Society supported over 100 Black Northwestern University students occupying the Bursar’s Office as a means to compel the campus administration to address discriminatory campus policies and to heighten awareness of Black students’ experiences of alienation at Northwestern University. 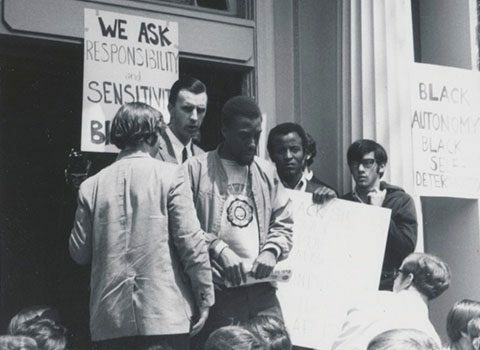 Thirty members of Students for Democratic Society held a simultaneous takeover by occupying the office of Jack Hinz, Northwestern University Dean of Students and Vice President. 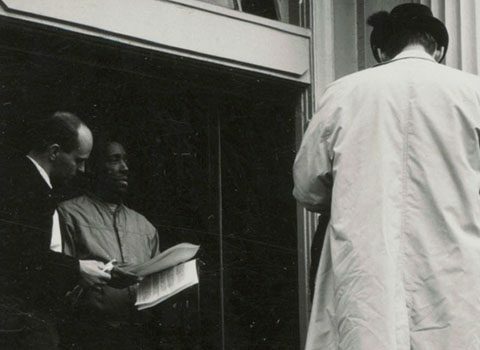 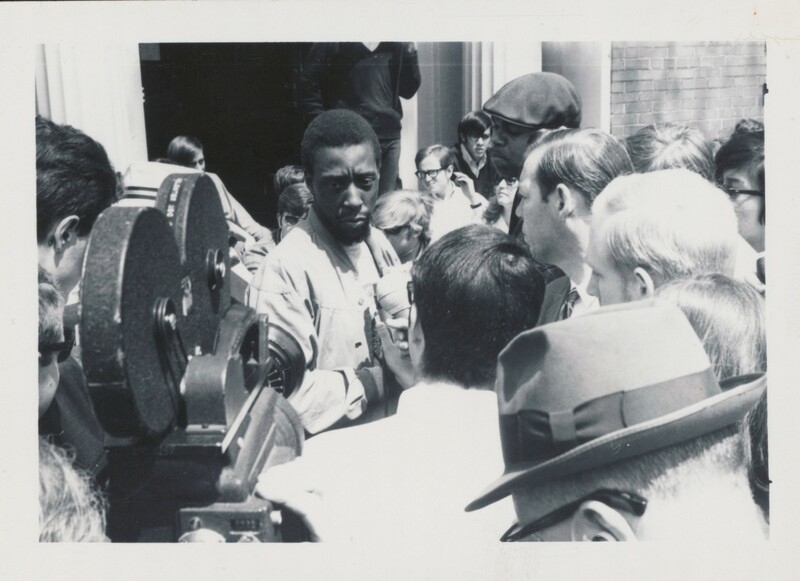 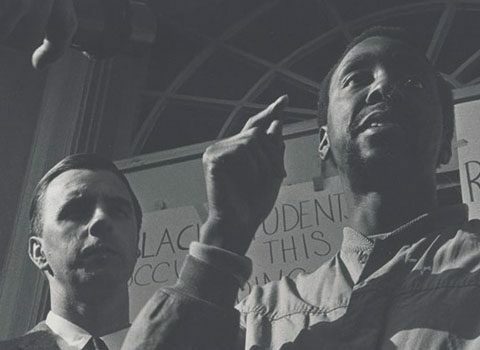 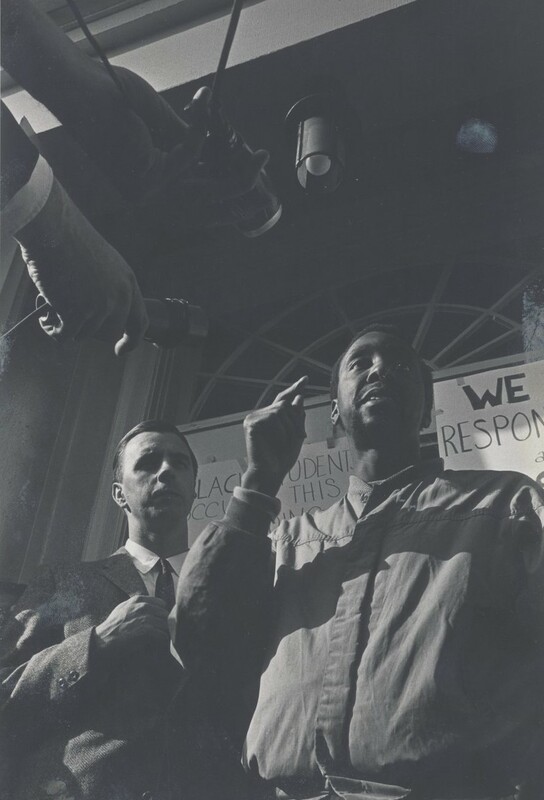 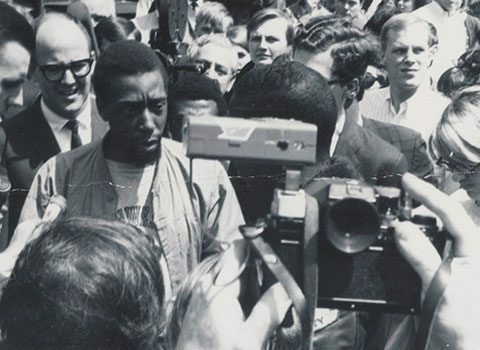 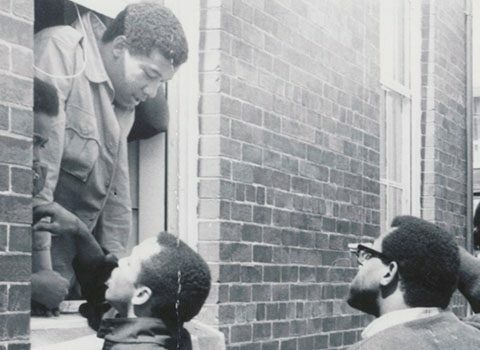 James Turner, President of Afro-American Student Union (AASU), and a lead negotiator in the Bursar’s Office Takeover holding the list of demands drafted by FMO and AASU and presented to Northwestern administration on April 22, 1968 and speaking with the press. 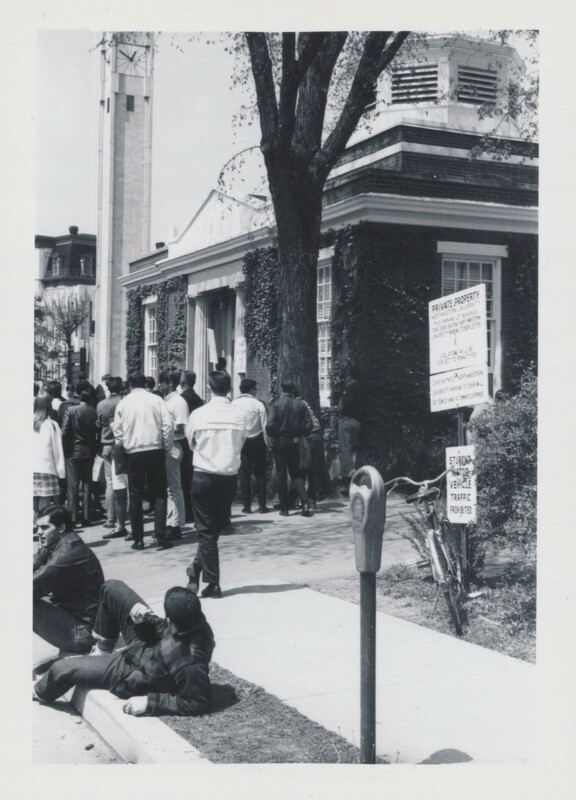 This photo is taken in front of the Bursar’s Office on 619 Clark Street in Evanston, IL. 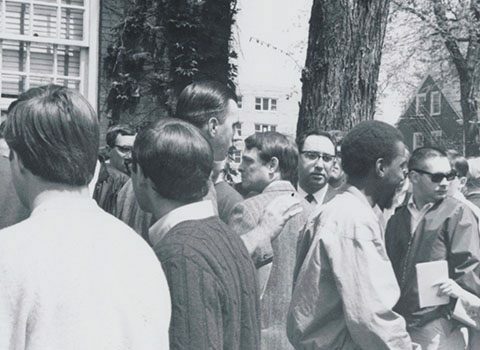 A crowd consisting of students, Northwestern staff, and the press gathers in front of the Bursar’s Office on 619 Clark Street in Evanston, IL as over 100 Black Northwestern University students occupy the building as a means to compel the campus administration to address racist policies and practices affecting Black students. 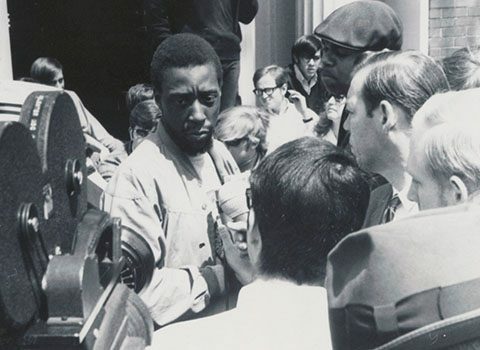 James Turner, President of Afro-American Student Union (AASU), and a lead negotiator in the Bursar’s Office Takeover speaking with the press. 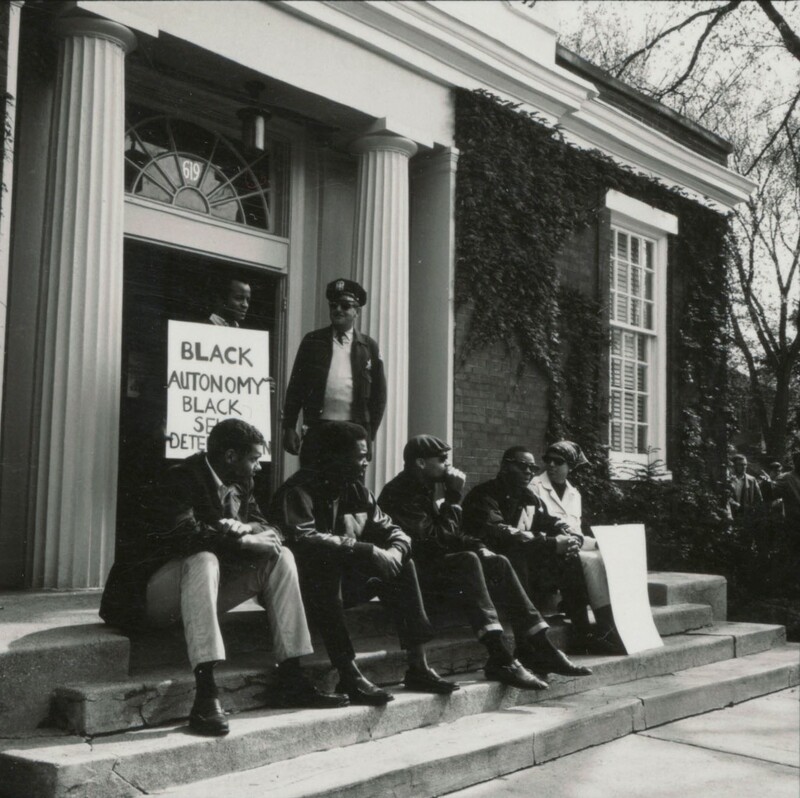 This photo is taken in front of the Bursar’s Office on 619 Clark Street in Evanston, IL. 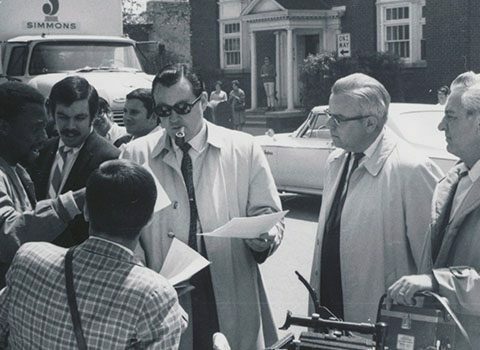 Harold Daniels is to the right of Turner. 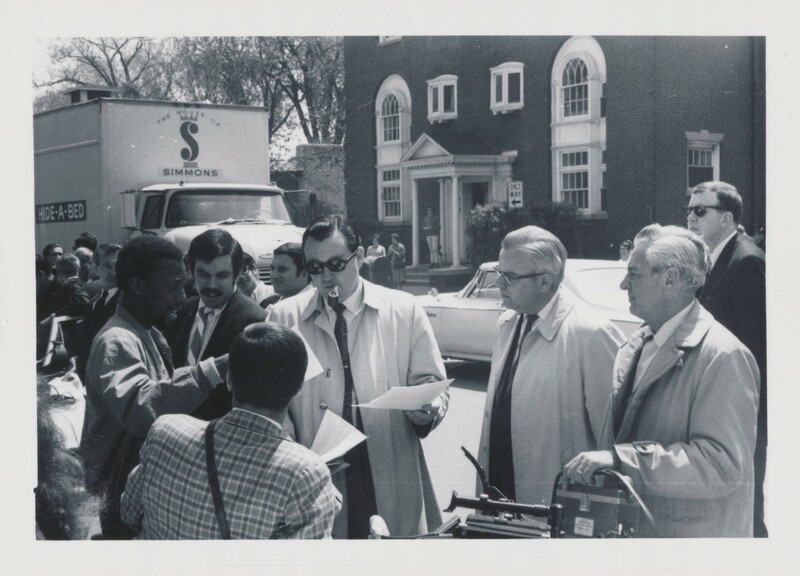 James Turner, President of Afro-American Student Union (AASU), and a lead negotiator in the Bursar’s Office Takeover speaking with the press in front of the Bursar’s Office on 619 Clark Street in Evanston, IL. 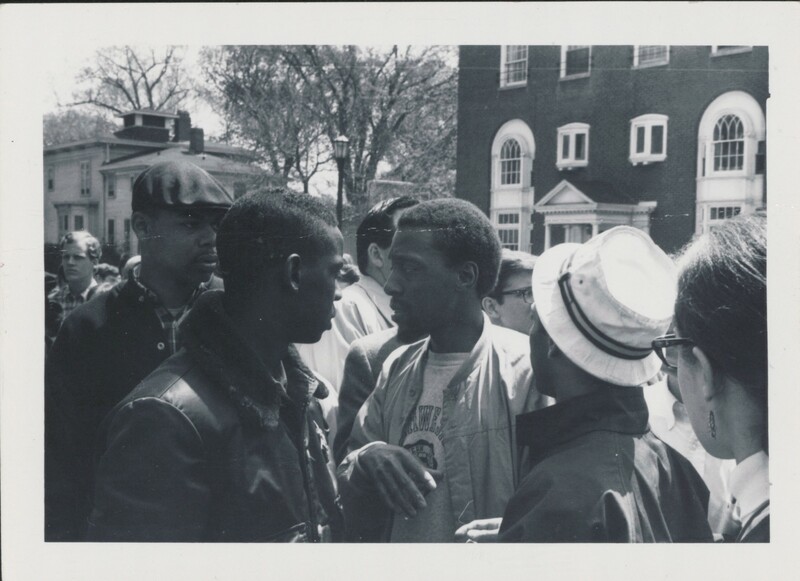 The image includes from left to right, Officer Venice Deeze, a friend to black students at Northwestern, Harold Daniels, and James Turner. 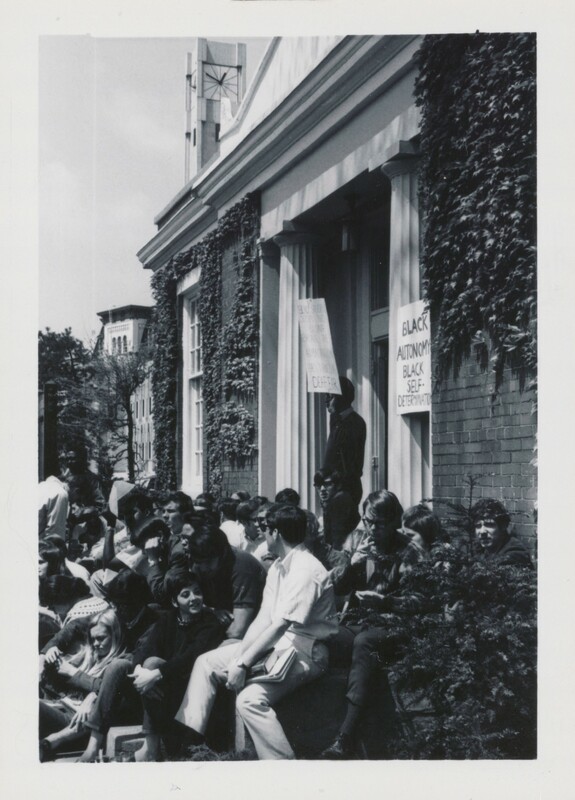 This photo is taken on the side of the Bursar’s Office on 619 Clark Street in Evanston, IL. 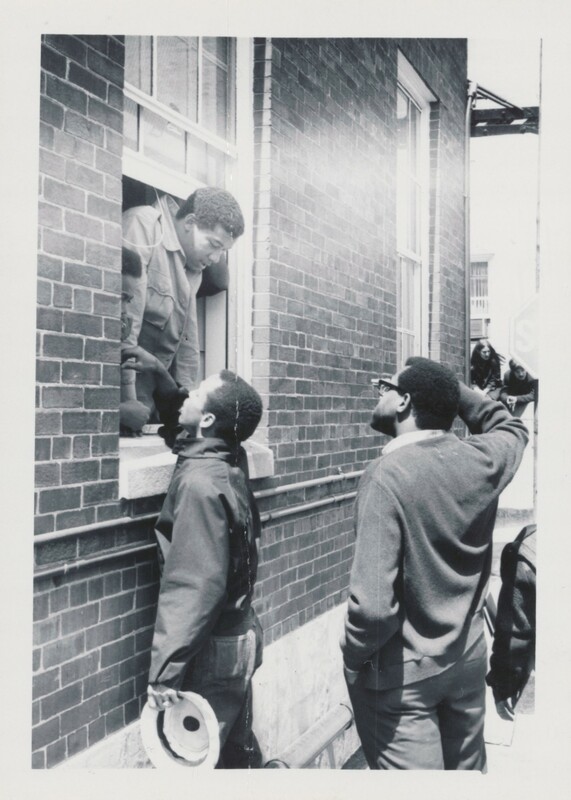 Takeover participants used the side window to enter and exit the office and to communicate with those outside of the building who supported them in solidarity. 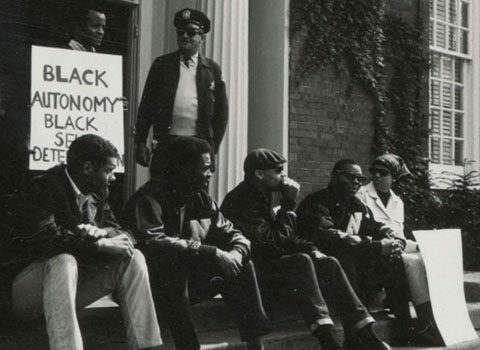 There were Black Northwestern University students who chose not to enter the Bursar’s Office during the Takeover for a number of reasons including the potential of jeopardizing their enrollment status, financial aid, and fear of a violent outcome. 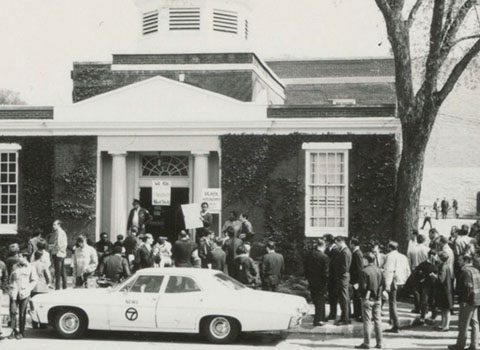 As an organization, FMO and AASU members voted to recuse athletes from occupying the building because they had the most to lose if their athletic scholarships were revoked. 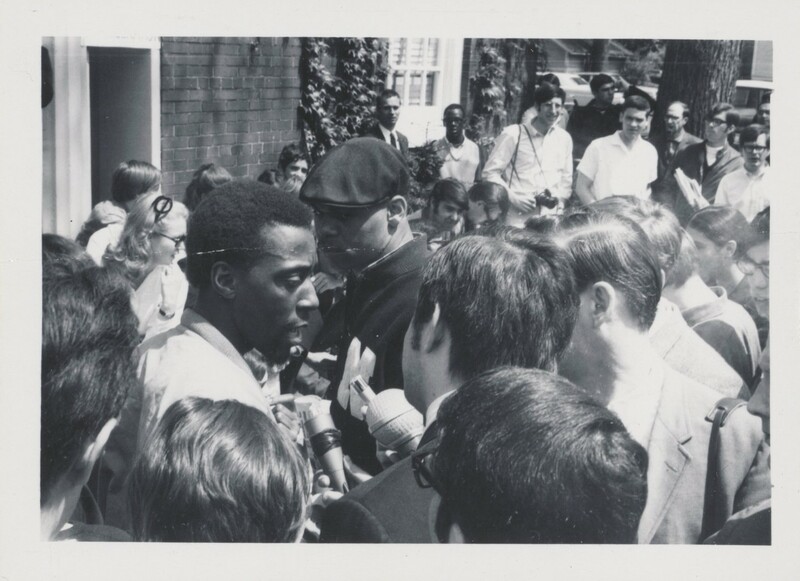 Some of those athletes are pictured here. 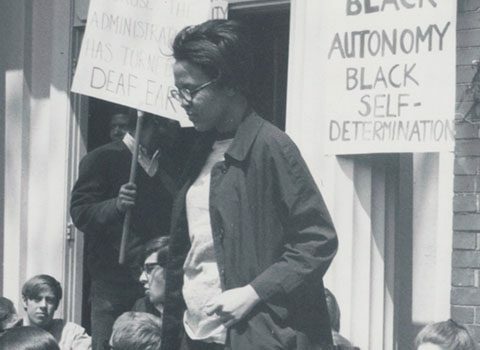 The woman to the right holding the sign is Laura Murray. 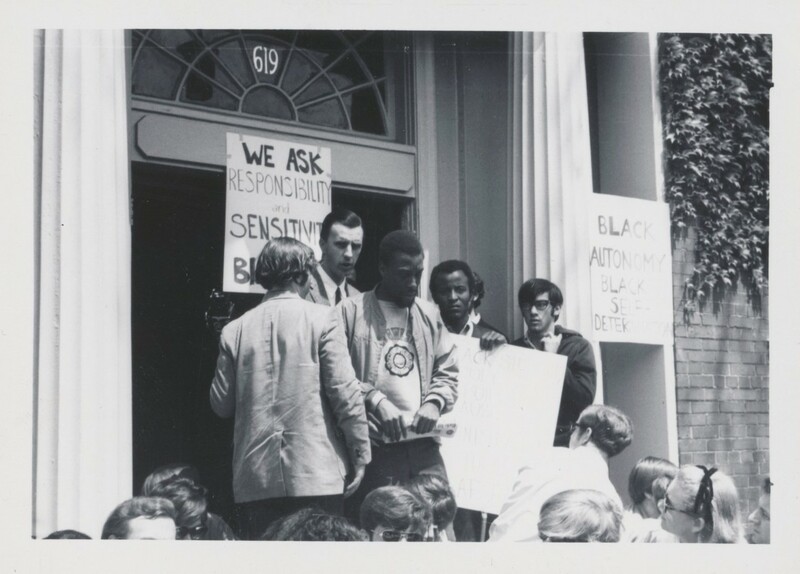 Stephen Broussard is holding the sign, “Black students occupy this building because the administration has turned a deaf ear.” The person holding the sign “Black autonomy Black self-determination,” is unknown. 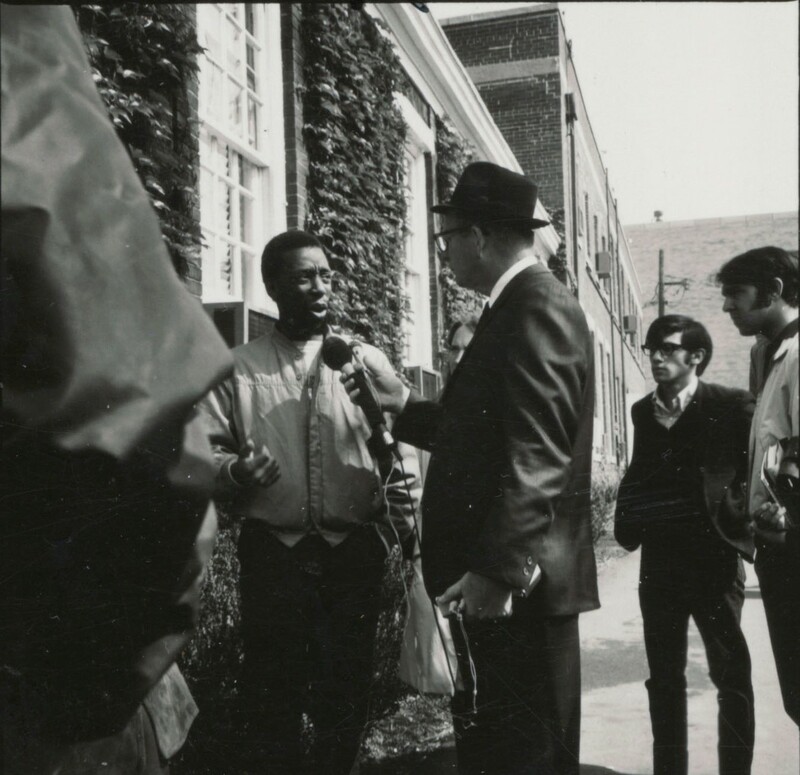 James Turner, President of Afro-American Student Union (AASU), and a lead negotiator in the Bursar’s Office Takeover speaking with the press in front of the Bursar’s Office on 619 Clark Street in Evanston, IL. 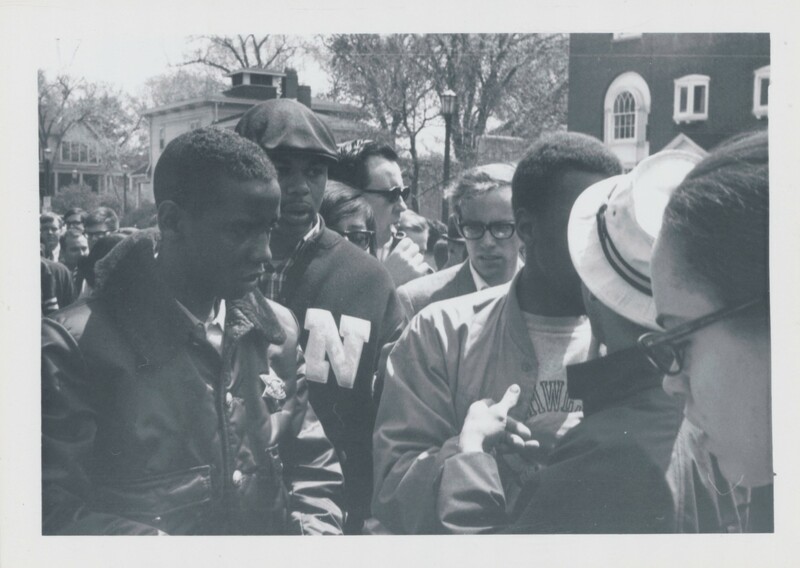 The image includes from left to right Harold Daniels, Officer Venice Deeze, a friend to black students at Northwestern, James Turner, and Mike Hudson. 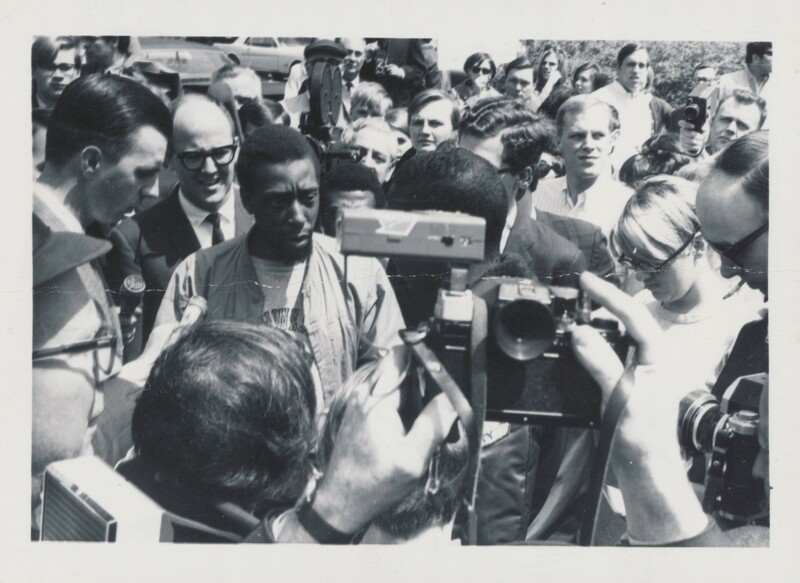 James Turner, President of Afro-American Student Union (AASU), and a lead negotiator in the Bursar’s Office Takeover speaking with the press. 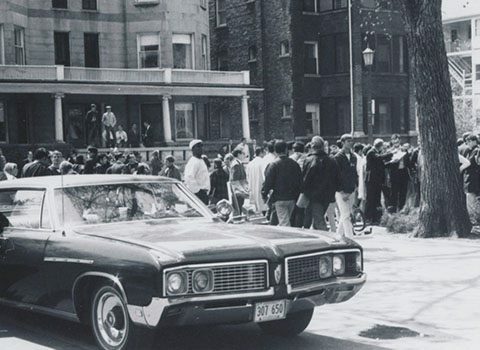 This photo is taken in front of the Bursar’s Office on 619 Clark Street in Evanston, IL. 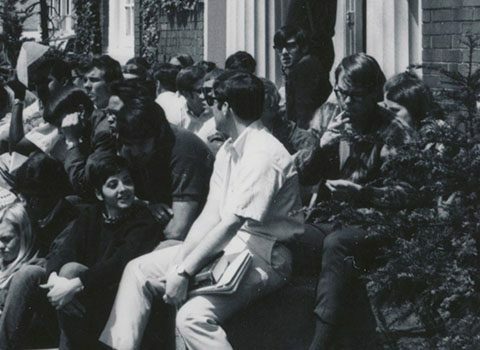 The Rebecca Crown Center, Northwestern University’s administration building, is pictured in the back. 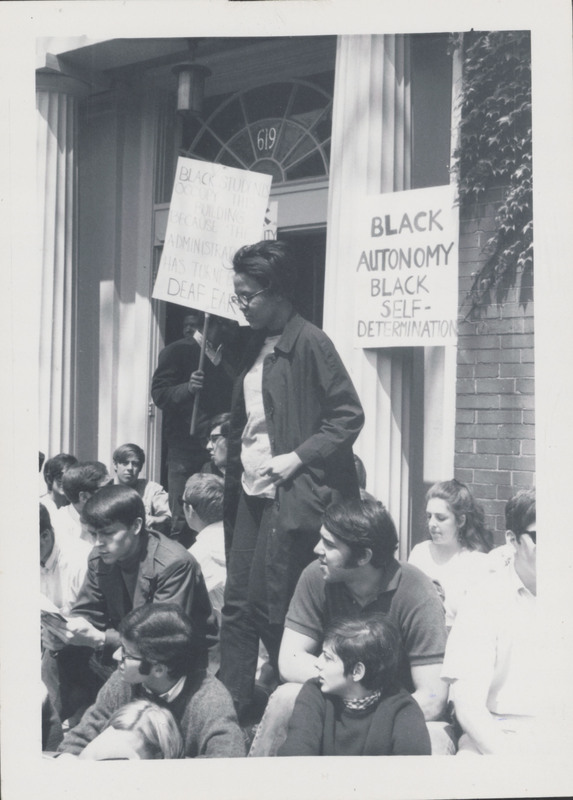 Northwestern University students, largely white students pictured here, join in solidarity with over 100 Black Northwestern University students occupying the Bursar’s Office as a means to compel the administration to discriminatory campus policies and to heighten awareness of Black students’ experiences of alienation at Northwestern University. 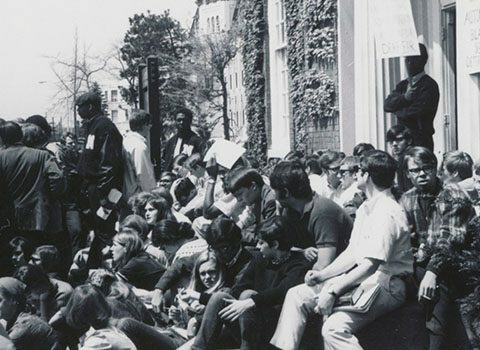 By sitting on the steps of the building, students were physically blocking the entry way to prevent an incident of police forcibly removing students inside. 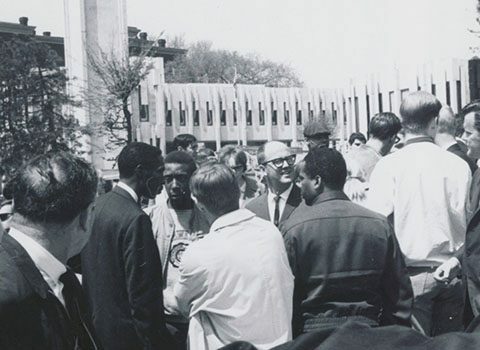 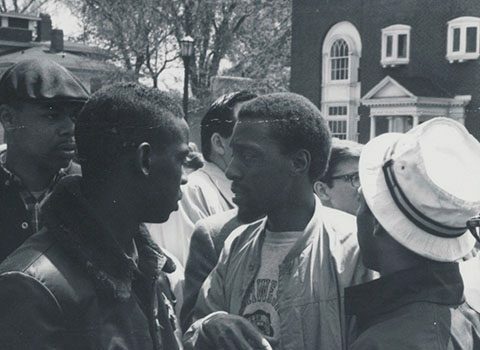 Throughout the day on Friday, May 3, 1968, James Turner, President of African American Student Union (AASU), and a lead negotiator in the Bursar’s Office Takeover, and Jack Hinz, Northwestern University Dean of Students and Vice President, met to negotiate an agreement between FMO, AASU, and the University regarding the April 22 demands presented to the NU by FMO and AASU. 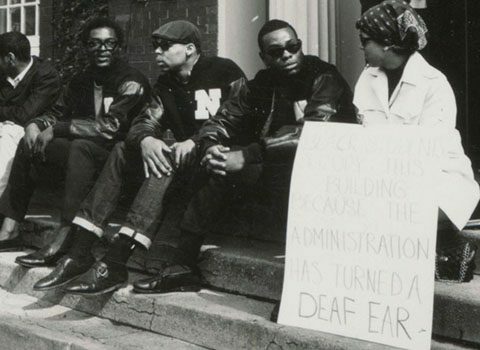 Northwestern University students, largely white students pictured here, join in solidarity with over 100 Black Northwestern University students occupying the Bursar’s Office as a means to compel the administration to address discriminatory campus policies and to heighten awareness of Black students’ experiences of alienation at Northwestern University. 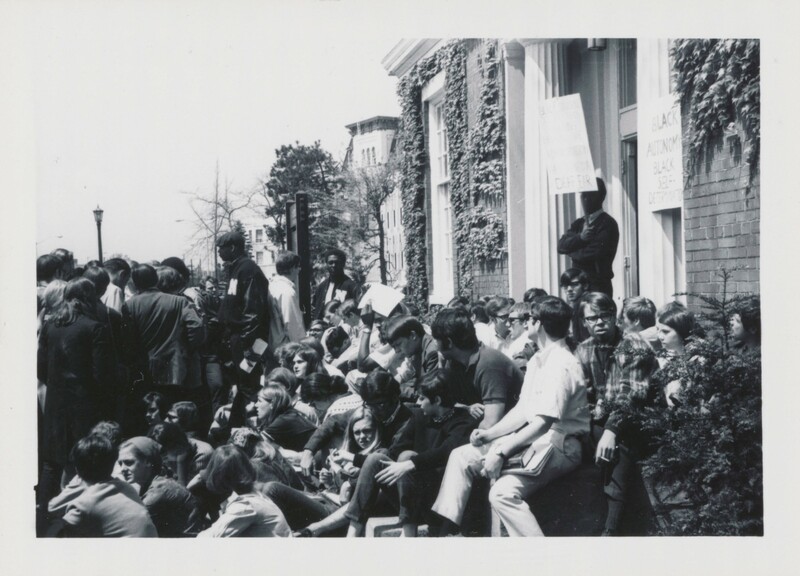 By sitting on the steps of the building, students were physically blocking the entry way to prevent an incident of police forcibly removing students inside. 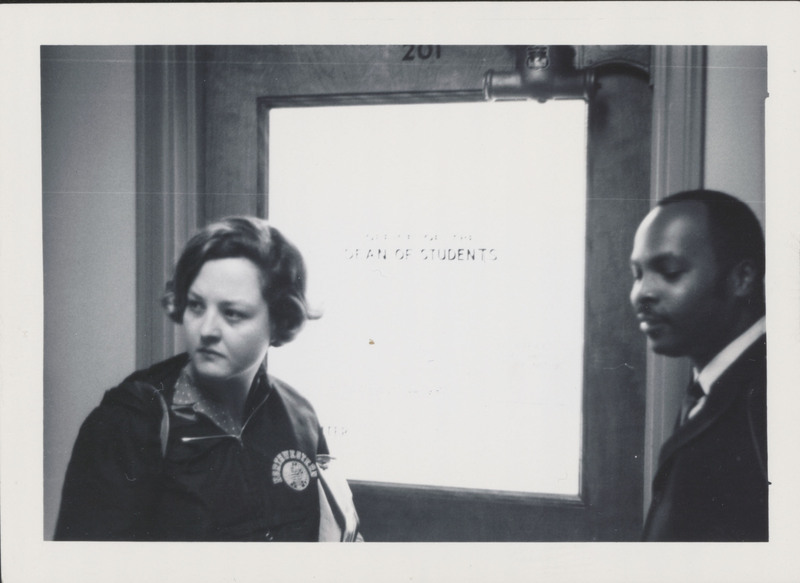 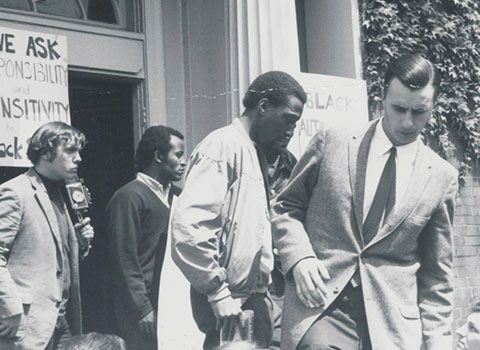 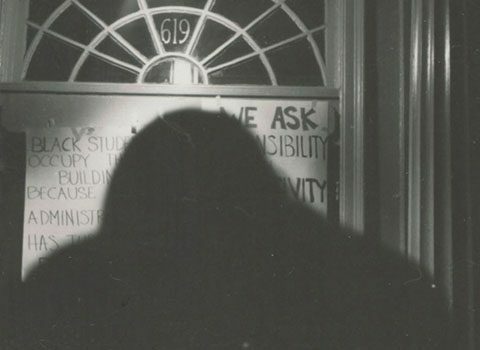 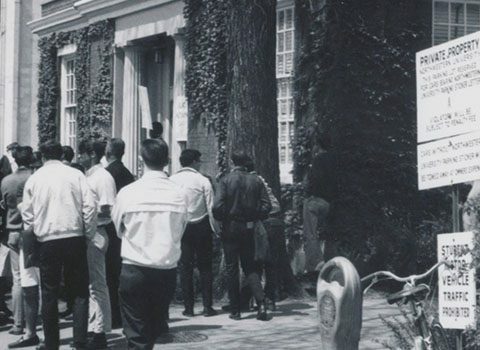 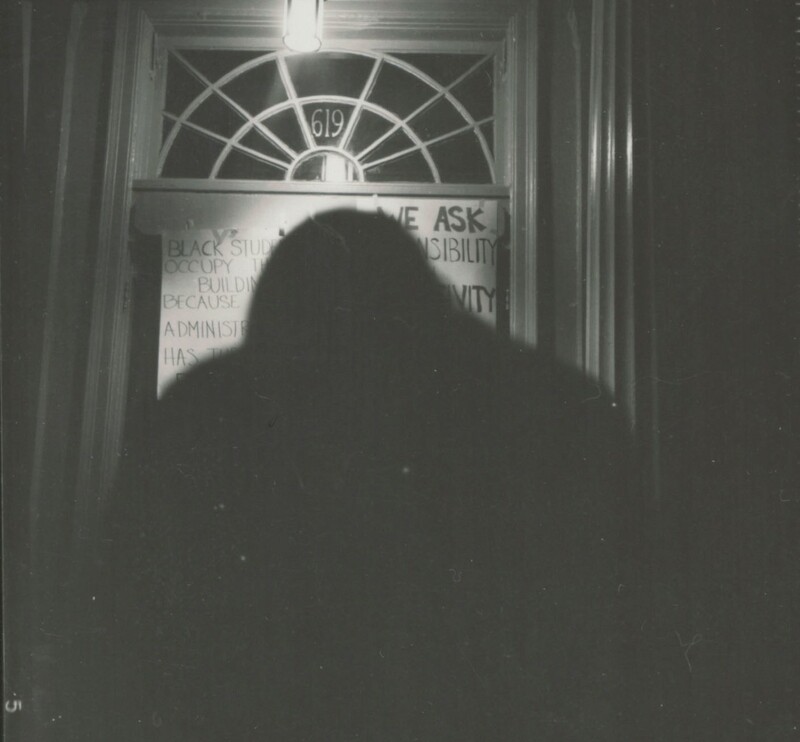 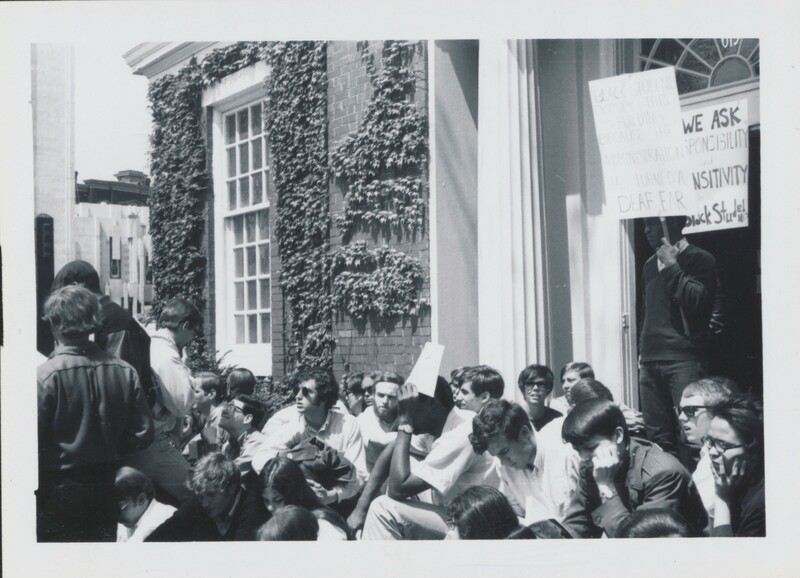 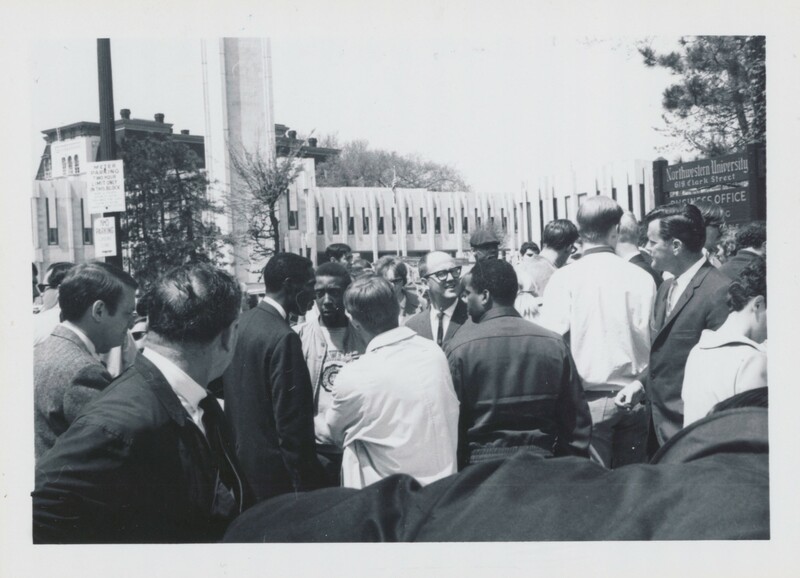 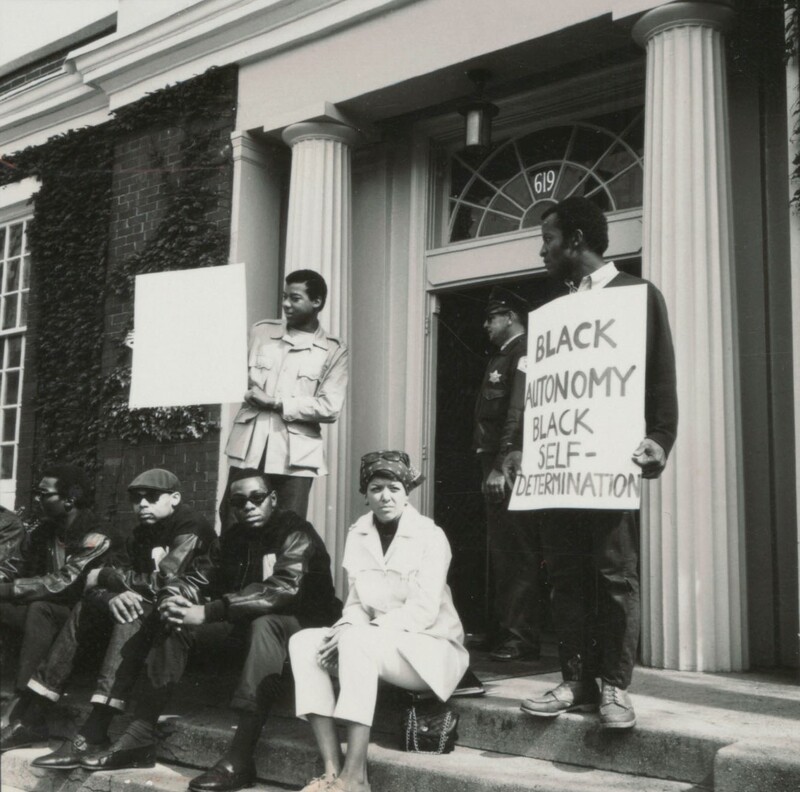 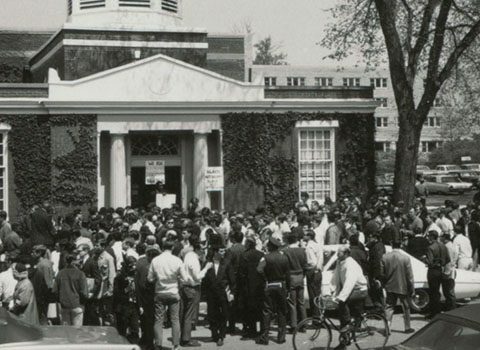 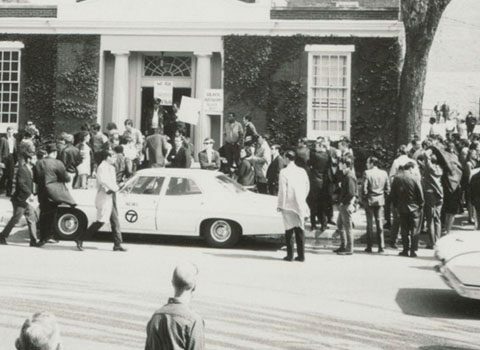 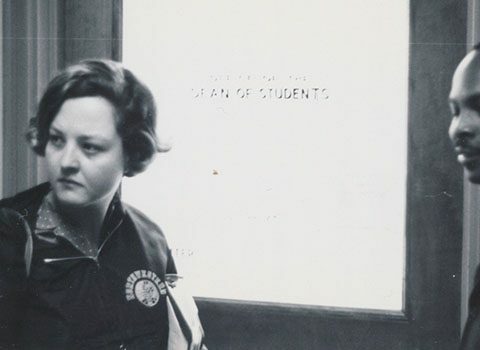 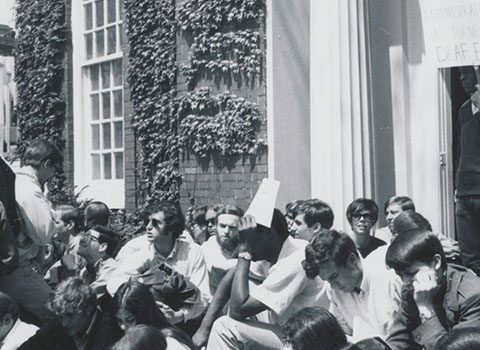 We welcome visitors to submit additional photographs that tell the story of the Bursar’s Office Takeover and Black student experience at Northwestern University. 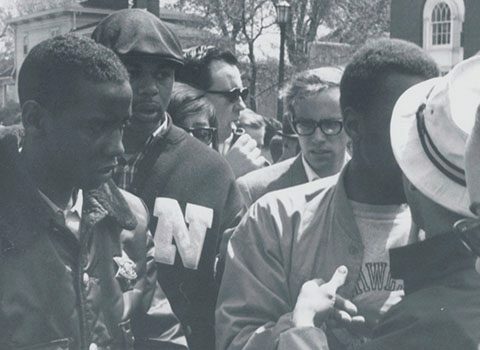 If you have information, please contact University Archives at archives@northwestern.edu.